Titan Creative Entertainment presents a tribute to the the Godfather of Soul himself … Mr. James Brown starring Mike. Mike’s explosive intensity, incredible vocals and accurate choreography are perfectly showcased in this dynamic show which includes “Night Train”, “Papa’s Got A Brand New Bag” and … of course … “I Feel Good”. Mike is “Mr. 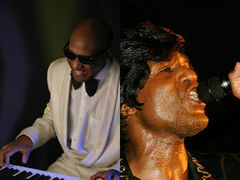 Dynamite” himself and the perfect choice to entertain a broad spectrum of music fans at almost any venue. Always backed by the hottest players in the biz Mike’s the hardest working tribute artist you will ever see. Check out his live, promotional video and see the amazing Mike do his thang!